On a night that belonged to Kobe Bryant because of the retirement of his No. 8 and No. 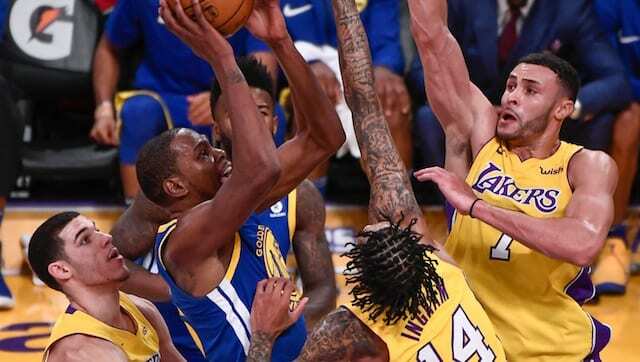 24 jerseys, the Los Angeles Lakers again played the Golden State Warriors tough, only to suffer another overtime loss. The matchup was the second this season between the teams, and first of two this week. In addition to being without Stephen Curry, Draymond Green, Shaun Livingston and Zaza Pachulia, the Warriors were also forced to overcome poor shooting from Kevin Durant and Klay Thompson. He began the night 0-for-7 before connecting on a 3-pointer late in the first quarter, which was part of a Warriors’ 22-6 run to erase an early eight-point deficit. Durant otherwise continued his all-around play with Curry sidelined, as he finished the night with 36 points on 10-of-29 shooting, 11 rebounds, eight assists and three blocks. Durant hit a go-ahead jumper over Lonzo Ball with six seconds remaining in overtime. Thompson was the only other Warriors starter to score in double-figures, contributing with 17 points, largely behind four 3-point baskets. Omri Caspi (14 points) and Nick Young (10) led the attack off the bench for Golden State. In a rematch with the reigning Finals MVP, Brandon Ingram failed to replicate his career-best, 32-point performance but still showed encouraging signs of development. The third quarter saw a stretch where Ingram had three consecutive shot attempts blocked at the basket. The last of which resulted in Ingram crashing hard to the ground and remaining down until the Lakers managed to call a timeout. Ingram walked off under his own power, went to the locker room but returned after being diagnosed with a right cheek contusion. To his credit, Ingram returned and maintained the same level of aggression he’s displayed over the past two weeks. Ingram scored 19 points, with his layup tying the game late in the fourth quarter. However, he was the Lakers’ primary culprit for their poor free-throw shooting as he made just 7-of-12 attempts. As a team, the Lakers were just 22-for-35 from the line. 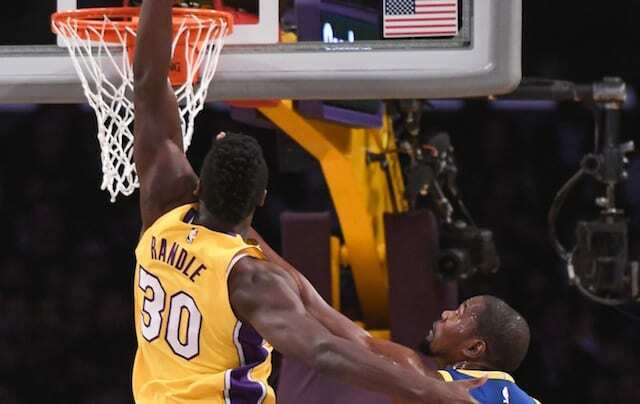 Julius Randle split a pair to tie the game before Durant’s game-winning basket. Lonzo Ball scored seven of his 16 points in overtime, but had his layup attempt blocked with less than two seconds left in overtime. Ball added six rebounds and five assists. Kyle Kuzma had team-high 25 points, to go along with six rebounds and three assists in 40 minutes off the bench. It was a fourth consecutive game in which Kuzma scored in double-figures, and a sixth time in the last seven contests. Although Ingram managed to avoid an injury that cut his night short, Brook Lopez was not as fortunate. He suffered a sprained right ankle prior to halftime and did not return. X-rays came back negative, but Lopez is scheduled to undergo an MRI on Tuesday. He had six points and one rebound in 11 minutes. With their 116-114 victory, the Warriors extended their season-best winning streak to nine games.